Florida Governor Rick Scott lays out his school safety proposal during a press conference at the Florida Capitol in Tallahassee, Fla., Friday, Feb 23, 2018. TALLAHASSEE, Fla. -- Flanked by family members of students who were killed during a mass shooting just over three weeks ago, Florida Gov. Rick Scott on Friday signed a $400 million school safety bill in response to the tragedy that killed 17 people at a high school. He said the bill, which was written since the shooting, balances "our individual rights with need for public safety." "It's an example to the entire country that government can and has, moved fast." The bill isn't what many of the shooting's survivors, or the school's students, wanted - they said it doesn't go far enough. It also marks Scott's break with the National Rifle Association, and the group's powerful lobbyist called the bill "a display of bullying and coercion" that would violate Second Amendment rights and punish law-abiding citizens. It raises the minimum age to buy rifles from 18 to 21 and creates a waiting period on sales of the weapons. It also creates a so-called "guardian" program that enables teachers and other school employees in participating districts to carry handguns if they complete law enforcement training. Scott said he is still "not persuaded" about the guardian program. "I'm glad however, the plan in this bill is not mandatory," he said, adding that the program will be up to local officials to implement. "If counties don't want to do this, they can simply say no." He said he's signing the legislation because it makes schools safer. He singled out two fathers whose children were killed, saying that they walked the halls of the Legislature since the shooting to enact change. "Obviously, this is what we've been fighting for. It's nowhere near the long-term solution," said Chris Grady, a senior at Marjory Stoneman Douglas High School and one of the organizers of the March for Life later this month in Washington, D.C. "It's a baby step, but a huge step at the same time. Florida hasn't passed any legislation like this in God knows how long. It's nowhere near what we want, but it's progress and uplifting to see." Scott told the students: "You helped change our state. You made a difference. You should be proud." The bill narrowly passed the House and Senate, and falls short of what he wanted and what survivors of the massacre demanded. Florida's teachers union and the National Rifle Association are opposed. In schools, it would create a "guardian" program enabling staff with law enforcement training and school district approval to carry concealed handguns on campus. It would create new mental health programs for schools and establish an anonymous tip line where students and others could report threats. It also seeks to improve communication between schools, law enforcement and state agencies. The NRA opposes raising age limits to buy weapons or imposing new waiting periods. In a statement Thursday, NRA and Unified Sportsmen of Florida lobbyist Marion Hammer called the bill "a display of bullying and coercion" that would violate Second Amendment rights and punish law-abiding citizens. Broward County teachers union President Anna Fusco met with Lt. Gov. Carlos Lopez-Cantera and let him know that teachers support the school safety bill, but don't like the provision that allows school employees and some teachers to carry guns after receiving law enforcement training. She said she wants Gov. 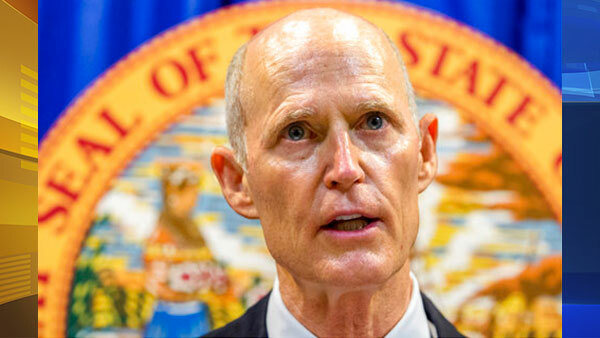 Rick Scott to veto the money for the so-called guardian program when he receives the budget. Scott can't veto individual items in the bill itself, but can does have line-item veto power with the budget. "We support the bill," Fusco said. "I know there's lots of things in there that are a start, and there's in there that's going to bring some pieces back together for Parkland. But there's a piece in there that we're concerned about - arming educators in schools." The program to arm teachers would be optional, and the Broward County school superintendent has already said he doesn't want to participate. Fusco said she expects Scott to sign the bill. Cruz's public defender withdrew an initial not guilty plea, leaving him to "stand mute" for now, but has said he will plead guilty if prosecutors take the death penalty off the table and sentence him to life in prison instead. Prosecutors have not announced a decision. Associated Press writers Jason Dearen in Gainesville, Tamara Lush in St. Petersburg, Terry Spencer, Jennifer Kay and Adriana Gomez Licon in Miami contributed to this report.